Identifying Sirius as the most important piece in this puzzle, and showing the horizon placed beneath the Queen Chamber and the southern meridian aligned with the east-west axis of the pyramid, the question of certainty can now be accommodated by the courses of the pyramid. It cannot be a simple affair of the courses being such as they are, with so many differing thicknesses creating the pyramid, without importance being placed upon these courses in some way rather than they being a conditional part of the strength of the structure. 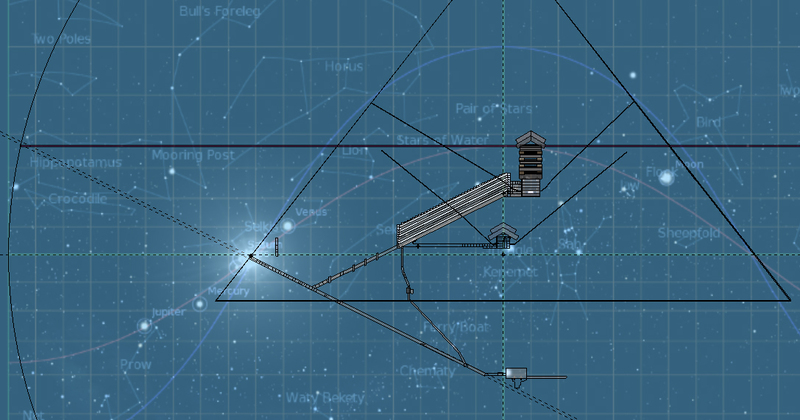 To show the 20th and 21st courses as interacting with the feature above the entrance and the horizon through the pyramid, and denoting the distance between the axis lines of the Queen and King chambers as defining the key for the astral overlay upon the pyramid, verification of this overlay is proved by the courses themselves. It is through the courses that the selection of Mercator-view in the astronomy program was verified. The latitudes of the overlay are such that they do not have the same distance between them as they rise above and below the horizon line as the longitudes do with their consistency of 43.333" equalling 1 degree. Besides the chambers, passages and shafts of the pyramid, the courses themselves most certainly play an instrumental role in the pyramid's planning, as having particular of them being thicker than others makes them stand out. To think of these differing thicknesses as being for the strength of the construction does not do the construction justice; the solidity of the pyramid and it standing the test of time and natural forces shows that the generations of pyramid builders and architects did not perfect upon their skills after this one, but only did worse. If the art and techniques of pyramid building were shared and wide spread, the Great Pyramid would be not just a great leap forward in character for the fourth dynasty, but also a model of perfection being passed to all Pharaohs and architects after Khufu. Certainly the shape of the pyramid is standard, but the internals and constructions are not, let alone the sizes of them. In mentioning courses, only Menkaure's comes close to the perfection attained by Khufu, so particular is its core masonry like that of the larger pyramid, and yet it is proposed as being younger than the larger one. The inner core blocks of Khafre's pyramid are very much perfect as compared to both Khufu's and Menkaure's pyramids. Petrie provided the elevation measurements of the courses for the north-west and south-east corners, and shows that there are slight differences to most of the courses upon not just both corners but all four corners. By using a bar graph, Petrie detailed each course by showing the thickest measurement of a course as the vertical height, and indicated lines to do with the other three corners of a course within that bar. The following is a copy of Petrie's bar-graph of the courses indicating their mean thickness. The course number is indicated across the bottom of the graph in divisions of ten after the twentieth course; across the top of the graph are references to courses that are in specific ratios of width compared to the base, as 25ths, such as the 35th course being 16/25 of the base area, as Petrie had defined; the horizontal lines through the graph reflect course thickness, from 50” passing through the top of the 35th course, then 10” increments going down. The next image is of the 12,275 BCE overlay upon the pyramid and shows the courses relating to the latitudes in orange, and the course relating to the highest point of the equatorial line in blue. (A small but probably significant note to be included here is the sizes of the lines being shown to do with degrees which show longitudes and latitudes: because of how the images are produced, the lines measure 25” in thickness. All measurements and estimations shown are to the centres of these lines where ever they appear, except for the particulars of the architecture of the pyramid which are as exacting as Petrie and intelligent inference can convey. A course being measured is done to the measurement, and the thickness of the course is the thickness of the course, while the thickness of the degree line is approximately 25”). -10º latitude = 7th course: 278.25"-319.9"
Horizon = top of 20th course: 729.35"
10º = 35th course: 1137.65" - 1187.15"
20º = 48th course: 1603" - 1638.3"
30º = 66th course: 2088.4” - 2112.4"
40º = 86th course: 2617.1" - 2643.25"
50º = 107th course: 3226.6” - 3251.4"
60º/Equator = 138th course: 4000.05" - 4026.1"
70º = 184th course: 5025.15” - 5047.3"
The graph shows the latitude courses in orange, with the horizon courses in green, the equatorial course in blue, and the ecliptic course in pink. Having the latitude courses highlighted shows only the 30º and 50º courses as being right below stand-out courses, and considering the potential of the courses representing such as latitudes based upon astronomical planning, the possibility that the 30º and 50º courses are incorrect by one course would mean the 40th and equatorial courses would also be out by a course, and they appear to be indicated by stand-out courses. A possible scenario is indicated by the horizon being between the 20/21st courses, and as the latitudes indicated in the astronomy images are some 25” thick, the courses might include a lower and upper where the actual latitude is between them. One particular course to highlight is the equatorial/60º with the height above the pavement beginning at 4,000”. It was determined that the centre of the entrance passage upon the casing as measured from the CP below the Queen Chamber was approximately 4,000”, and while this might just be a coincidence, it does appear to be a purposeful one. To see Petrie's graph laid out, we can see that the pyramid can be broken down into sections of construction based upon thicker courses indicating important transitions, but what these transitions mean appears to coincide in one fashion with the latitude courses, and in another fashion as certain percentages of the base area. There would certainly be a further reason for the transitions which might include all the courses between transitions, and seeing how the chambers appear could offer up one answer. The chambers are shown according to their floor levels and do not include the thickness of the floors, so it is not certain if just one course below them should be included, or more than one course. The first blue course is the intersection of entrance and ascending passages, while the second is the start of the entrance passage. Seen like this, there is scant indication really that stand-out courses might indicate the chambers, except where the ridge line of the roof at the top of the relieving chambers is located, being one course below a certain section of eight courses which has the half-height of the pyramid within there. One interesting course is the 46th, being an exceptionally thinner one amidst its neighbours, much like the 20/21st courses are, and these are the only two areas that have quite thinner courses surrounded by thicker ones. Certainly on the outside of the pyramid there does not appear to be a hidden entrance in this course, but this does appear to be important in some way and a reason why will be identified later in the analysis. By consigning the base as being 9,073.12733 x 9,073.12733 = 82,319,639.5464 square inches, certain courses define an entire level as being 16/25, 10/25, 9/25 etc. in area in comparison to the base. A 25th equals 3,292,865.581856. A 25th measure of the length of 9,073 equals approximately 362.9251. The 35th course - being the 10º latitude course - is proposed as 16/25 of the base. The measurements from the model of the lengths of the course from one side of the casing to the other give approximately: 7,286.111" base; 7,208.356" top. 7,258.501864 x 7,258.501864 = 52,685,849.3097 defines 16/25 of the base area and 7,258.501864 = 20/25 of the base length, and Petrie certainly indicates that this course stands out in the pyramid and graph. The 48th/20º course: 6,555.14" base; 6,499.69" top, while 6,542.73" defines 13/25 of the area, and approximately 18/25 of the length, but approximately is not good enough, so percentages of area based upon 25 is the key for many of the stand-out courses. Other courses Petrie identified are: 44th course having a relationship of 14/25 of the base; 67th as 10/25; 74th as 9/25; 90th with 7/25; 98th with 6/25; 116th with 4/25; 144th with 2/25; 164th with 1/25; 180th as 1/50. Five-squared appears to be a particular kind of number to use in defining relationships to these stand-out courses and the base, but so too can other square numbers. Having the 19th course and its thickness as relating to the original entrance, and that there were none like it for eleven courses beneath it, nor fourteen courses above it, does not have a 25th relationship to the base. The 19th course, measured according to where the casing would be, is approximately 8,025" long at its base, 7,965" long at its top, with its centre-line 7,994". 8,001.7" is 28/36; and 7,990.07" is 38/49. Other thick courses also have similar fractions to the base, but for the latitude courses, only the 35th is in 25ths; the others are 50ths, 75ths and 125ths. Identified in this way, the factor of 25ths might be observable, but also might a factor of 250ths or even 2500ths be observable. The beauty of the 35th course, with the measure of 7,258.501864" within it having an association of 42/52 of the base area, and also 4/5 of the base side length, is an extraordinary duplication, and is the only course to do so in regards to fractions of area and length. As 36ths, 7,248.9" makes an area 23/36 of the base; as 49ths, 7,213.44" makes 31/49. This course passes through the Gallery in the upper part of its lower section, and through the ceiling blocks of the Queen Chamber, more so the second layer of them. According to the astral overlay, it also passes through Mintaka for the 12,275 BCE year. One more course to identify is the ecliptic course, which observes the lowest height of the Sun on winter solstice midday. It reaches the 78th course, at 2,426.3" to 2,449.85" above the pavement. This course passes through the upper portion of the topmost beams in the relieving chambers above the King Chamber. The graph doesn't indicate this course as being anything special compared to the courses surrounding it, and in projecting it to the side and the 360 deg boundary, what we see is this course intersecting the boundary exactly below the intersection of the projection of the entrance passage, which is the 79th course, seen in the following image. When the Cylinder view from Stellarium is used, there are no correlations between latitudes and specific courses like that for the Mercator view, and because of this and the alignment of the north shafts upon Megrez, as well as other factors yet to be discussed, Mercator was chosen. Mercator was a 16th century map-maker who adjusted the way maps were constructed to benefit mariners: having a map showing all degrees to be of the same size both in latitudinal and longitudinal directions means that a straight line between two points cannot be followed from a map over long distances as the destination will seemingly have curved away from the line. Mercator designed maps where the further a point was from the equator, the bigger the degree appeared to be, and this perfectly fixed the fault with making a straight line between two points, and being able to exactly follow it from embarkation to destination which was essential for mariners and travellers alike. Of some note here is Ptolemy, of the fourth century BCE, who had also used a similar technique for mapping distant places very accurately. Ptolemy had spent nearly a dozen years in Egypt, mostly in Alexandria, where he studied under the guidance of learned priests and scholars, and greatly influenced the direction of intelligent thinking upon his return to Greece. 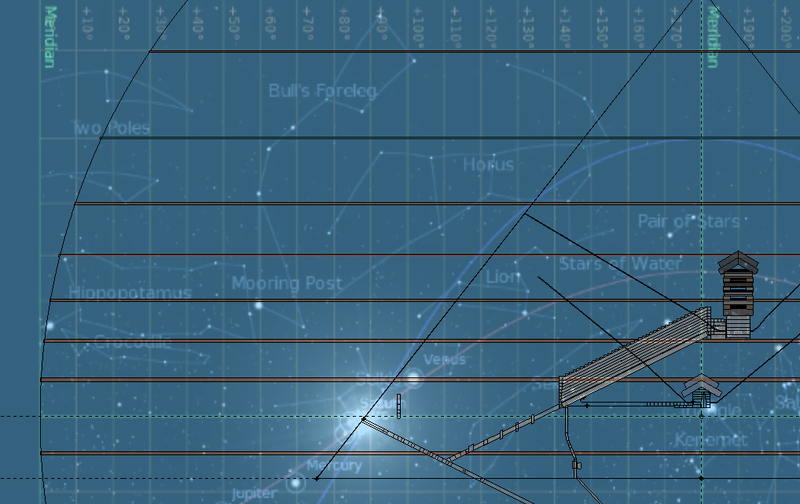 The astronomical overlay shows the stars and constellations laid out as they were in the thirteenth millennium BCE, and several correlations have been identified between the overlay and the pyramid, so there could be representations of particular stars in the courses just as the latitudes are represented. While this line of thinking is possible, there is a sky full of stars and some two hundred courses, and it would be too easy to assign stars to courses because any course could fit. Also, choosing which year to use and which time of day could certainly offer up correlations between course levels and particular stars, so trying to accommodate further actualities between courses and overlays is possibly fraught with coincidences rather than facts. In saying this, it is worth showing the stars of Leo expressed as courses of the pyramid for 12,275 BCE, just as an example; and while it is possible Sah and the Bull's Foreleg can also be shown where many stand-out courses agree with the horizontal locations of the stars in those constellations, it is just enough that there is the possibility that this kind of action may exist. The blue highlights indicate the main stars of Leo in their horizontal positions in regards to the courses of the pyramid, and certainly these courses are quite individual as compared to their neighbours. On the whole, all the courses of the pyramid are quite spread about in their various thicknesses, and there has to be sound logic for this apart from anything to do with greater stability for the construction, and quite possibly they represent stars. For the most part, the above is just a proposal, but certainly a very good one. According to Stellarium, the Sun on these dates at midday attains the apparent and observable heights of: 45º 09' 29” - 45.15805º for February 8th; and 45º 09' 35” - 45.1597º for November 2nd. There is a slight difference to these angles as defined by Petrie and Stellarium, but certainly that the shaft does have a slight angle to it from true south could have an effect at it being not at exactly midday but slightly off midday. Petrie definitely states the dates for the sunlight reaching down the shaft, and his defined angles do indeed confirm with Stellarium and the height of the Sun on those days, and that this is within one degree of the zenith of Sirius is quite extraordinary. All in all, it is suffice to say that the angle of the shaft pertains not just to the location of the Sun but also to the location of Sirius, and the half height of the pyramid mirrors these moments in a further exacting way. If the 95th course is the half-height of the pyramid where Sirius rests, then between this and the height of the Sun shining down the shaft means a difference of approximately 0.85º and has the 97th course for this location. This course represents the top of a section of eight courses and is between 22” and 26” thick, with the 98th course about 40” thick. Given the appearance of the graph of courses, it appears that this section represents a certain transitional area that the whole lower height of the pyramid is somewhat mirrored above this section, up to the 143rd course. The courses from 144 to 149 are another definite section, which then gives way to a whole visually different section ending at 195th course. The next eight courses are thicker again but there was another 300-odd inches of height to go, and nothing can be certain about those courses. It is at this juncture that observations and comparisons to Khufu's time should be defined and understood, and in so doing, a range of alternate time periods extending from the thirteenth millennium BCE through to not just Khufu but also the seventh century CE could identify further correlations to particulars of the pyramid.